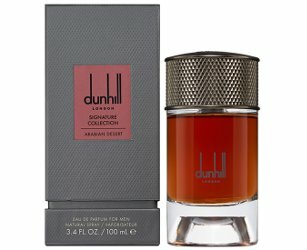 Dunhill has launched the Signature Collection, a new quartet of fragrances for men: Arabian Desert, Indian Sandalwood, Moroccan Amber and British Leather. Arabian Desert (shown) ~ "Inspired by the glinting sun on the Arabian desert, this Dunhill fragrance is a sleek scent for the modern man. Peppered with spicy saffron, it has a rich masculine feel to it." Additional notes include pink pepper, rose and oud. Indian Sandalwood ~ "Focusing on the warm scent of soft wood, the Dunhill Indian Sandalwood will make a subtle addition to your fragrance edit. Intertwined with bergamot, it is uplifted with breezes of tree moss and patchouli." Moroccan Amber ~ "Inspired by adventurous experiences and the trade of spice, the Dunhill Moroccan Amber conjures intense woody scents. Blending earthy notes of cardamom together with saffron, wafts of warm amber add a deep intensity." British Leather ~ "Liquid leather captured in a bold bottle, the Dunhill British Leather fragrance takes notes from the history and the present.The masculine fern scent is offset with feminine violet leaf, a contemporary concoction for the modern man. Dunhill Arabian Desert, Indian Sandalwood, Moroccan Amber and British Leather are available now at Harrods in the UK, £120 each for 100 ml Eau de Parfum.